I started my time in the Academy, or what’s known now as Ensemble Connect, exactly 10 years ago. At that time, I was freshly out of school and grateful to feel attached to something and not completely unmoored in New York City. I think that there is a special connection people make at this vulnerable stage in our lives and this was forged within those two years of the fellowship. I was inspired by my “fellow-fellows" and was happy that we worked to create a community of people who were looking for creative ways to be musicians and of course to survive in New York! 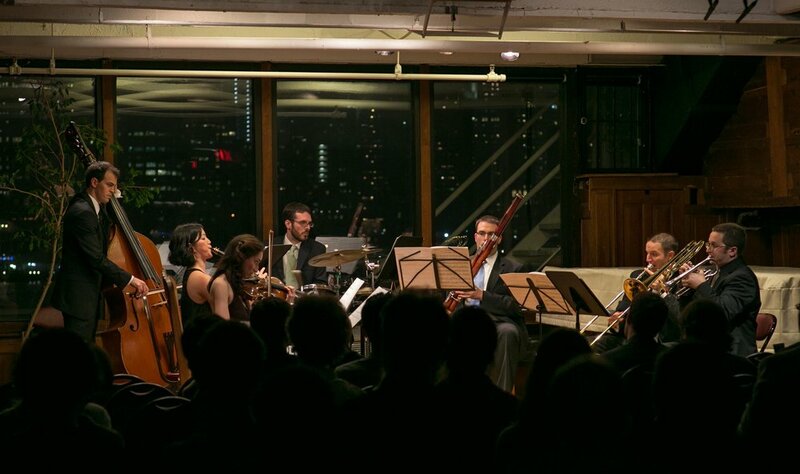 As we left the comfy luxury of our Carnegie fellowship, this community decided to dive head-first into the deep waters of self-run-freelance-chamber-ensembles. A challenging proposition, but we were into it! So Decoda was born (or… The Declassified…as covered by the NY Times before our name change). It is amazing to remember the amount of work and effort we all gave to the process of creating our group. We pooled our resources to perform in as many places as possible and to expose ourselves and our name to the world. I recall quite clearly our “kick-off” week in 2012; we worked tirelessly, running around the city, and rehearsing wherever we could possibly find free space. There’s really nothing quite like that feeling of being young, scrappy, and all in it together. Over the years, it’s been thrilling to see how we as artists and the group itself has matured. Each year was a learning experience and as we rotated leadership, we saw different facets of the group come to life and we really started to hone our identity. Now, with nearly a hundred concerts and residencies performed around the world and under our belt, we are primed and EXCITED for our return back to our first home, Carnegie Hall. We would love to see you at our concert this Wednesday, November 14th at 7:30pm in Weill Hall! Doors open at 6:30pm. Join us after the concert for a drink and discussion in the Jacobs Room. Decoda's program was in conjunction with the exhibition Sargent: Portraits of Artists and Friends, which was on view June 30th - October 4th, 2015. Read more about the program here. Who grows up in a household where there is a kiln AND a darkroom in the basement? Well, that would be me…and although I grew up to become a musician, my artist parents had an undeniable influence on my musical life. Those countless childhood visits to galleries and museums really stick with you in unexpected ways! In my second curated concert for Decoda at the MET Museum, I was inspired by the MET’s special exhibit of the portrait painter John Singer Sargent. These were portraits he created of his close friends – artist friends. It was fun for me to reflect on childhood memories of my parents’ fascinating and brilliant friends, and I immediately wanted to translate this concept to music – what kinds of musical portraits have been composed to portray those in a composer’s inner circle? "As a pendant to its dazzling exhibition devoted to the portraiture of John Singer Sargent, the musicians of Decoda, for whom versatility is a watchword, put together a unique program of incisive musical portraits by such composers as Britten, Ravel, Schubert, Ned Rorem, Aaron Jay Kernis ('Mozart en Route'), David Lang, and Charles Mingus ('Self-Portrait in Three Colors').."
Several years ago, at an early meeting for Decoda, we submitted our ‘big dream’ proposals for the future of our ensemble. Mine was the White House. This year, that dream came true. This past April, Decoda was fortunate to have columnist Kathleen Parker from the Washington Post - "With a song in prisoner's hearts" - join us in Bishopville, South Carolina for our second week-long songwriting workshop at Lee Correctional Institution. Kathleen dedicated one of her weekly (and nationally syndicated) columns to sharing her experiences from the prison, witnessing thirty incarcerated men collaborating together to write nineteen new and original songs based upon the theme ‘Transformation’, inspired by Decoda’s concert repertoire that week (at the Fine Arts Center of Kershaw County) which included Strauss’ Metamorphosen. Hear three of those songs here. Kathleen was struck by the same things we have also been struck by when music enters and envelops an environment such as a prison — the transformative powers these musical experiences expose and the soft-skills they provide are conclusive: a safe space to create, a sense of hope, feelings of self-worth, collaborative skills, self-reflection, problem solving tactics, personal motivation, listening skills, a sense of accomplishment, risk & reward, leadership, adaptability, conflict resolution, and empathy, among many, many others. It was because of Kathleen’s efforts that our work in the justice system landed on the desk of Valerie Jarrett, Senior Advisor to President Obama. I received an email from Ms. Jarrett in late July and from that point on, things moved very quickly. About one week later, Brad Balliett, James Austin Smith, and I were at the White House for a meeting with Roy Austin, Jr. and his team. Roy Austin, Jr., the deputy assistant to President Obama and director of the White House Office of Urban Affairs, Justice, and Opportunity, was a most warm and welcoming host. He is also a huge music and arts lover! His spoke of his father, Roy Austin, and told us of his father’s belief and use of music of to bring significant social change to his homeland territories of the Caribbean. There was no need to sell him or the administration on the power of the arts to transform lives; it was a mutual position, thus the reason for our invitation. During the meeting we were able to get into the details of our projects, our future goals, and where we can turn our focus to create chartable change over the next few years. How do these programs and projects work together with the President’s commitment to bringing substantive reform to our country’s criminal justice system - from prevention, to incarceration, to reentry? There is much to think about and consider - where can we as an organization make the most impact right now through music in the justice system? To our surprise and delight, Ms. Jarrett stopped by our meeting to say hello and to lend her support. We were able to leave Ms. Jarrett and Mr. Austin with CD’s of original songs and thick books of letters and testimonials from the men at Lee Correctional about what this music program has meant to their progress during incarceration. We left feeling challenged and activated. Read Roy Austin Jr.’s blog about the December 17th event at the White House here. Over the next several months, Mr. Austin personally and graciously introduced us to several excellent contacts each of whom are involved in innovative arts programming in the justice system around the country. One of the individuals I had the chance to get to know over email and phone was Sabra Williams, the director of the Actors’ Gang Prison Project, a California-based theatre organization who's Artistic Director is Academy-Award Winner Tim Robbins. Sabra and her colleagues are doing some incredible work through theater at prisons all over California - please take a moment to check them out here. Through their outstanding leadership and efforts, Sabra and Tim cultivated an event (put together very quickly!) at the White House for December 17th, in collaboration with Ms. Jarrett and Mr. Austin's phenomenal staff, dedicated entirely to innovative arts programming as part of the President’s criminal justice reform, with particular attention to reentry into society. The entire afternoon was extremely thrilling and inspiring. The event, held in the South Court Auditorium of the Eisenhower Executive Offices, had a robust array of attendees, including keynote speeches from Valerie Jarrett, Attorney General Loretta Lynch, and Roy Austin, Jr., to members of Congress (bi-partisan representation! ), governmental agencies (such as Department of Justice), governmental and private foundations, a multitude of arts organizations and advocates dedicated to criminal justice reform with the inclusion of the arts, state and federal wardens and officers from correctional facilities, and formerly incarcerated people who have not only successfully reentered into society but are now giving back their time and energy to this very issue. We were honored to present three original works written by incarcerated men (one of whom has been released and one who will be released later this year) during our work at Sing Sing Correctional Facility (with Carnegie Hall’s Musical Connections Program) and our project at Lee Correctional Institution. We were lucky to be joined by the wonderful jazz vocalist, Sarah Elizabeth Charles. Following our performance, which came at the top of the program right after the eloquent and passionate words spoken by Valerie Jarrett and Attorney General Loretta Lynch, I participated in my very first panel (whoa - at the White House!!) moderated by E-News Host and actor Terrence Jenkins, as I sat alongside the prominent arts and justice advocates/activists Jane Chu, National Endowment for the Arts Chairman; Vivian Nixon, Director of College and Community Fellowship; and Claire Schwadron, from Class Act Arts. We were elated to have had the opportunity to share the music and stories from our work in the justice system with such an esteemed community of caring and committed individuals. Our experience at the White House solidified that artistic programming in the justice system - with youth, with incarcerated communities, and our continued relationships with the formerly incarcerated - is notonly critical, but vital. All people, no matter their previous experience, exposure, or expertise, deserve the freedom for their own creative voices to be empowered through the sole gateway which provides such an honest potential for transformation, change, and reform: the arts. So, where do we go from here? In February, our program at Lee Correctional Institution in Bishopville, SC continues and grows, with a weeklong songwriting workshop with 35 men from their community in a program designed by the men themselves called, ‘Seasons of Life’, inspired by the Vivaldi Four Seasons. The men have progressed on their own since our last visit - now possessing 10 of their own music instructors teaching over 120 inmates instrumental classes, songwriting workshops and hip-hop workshops. In addition to a host of guitars, basses, keyboard students, and thanks to several generous donors, the prison now has its very first string quartet! In the spring, we will be back at Sing Sing Correctional Facility and at Belmont High School in Brooklyn, NY, an after school program for at-risk youth, both projects are part of Carnegie Hall’s Musical Connections Program. Future dreams for Decoda and our justice initiatives: more programs right here in NYC - at Rikers Island for their juvenile detainees, and our own free, after-school songwriting program in Washington Heights for at-risk youth. This White House dream realized is a reminder that with a steady and energetic vision, dreams can come true, and the future can be changed, one person and community at a time, through the power of music and the arts. Watch this short video to find out our exciting news!! Decoda is thrilled to open Tertulia's 2014 - 2015 Season at Harding's restaurant in NYC! Come join us this Monday, September 29th at 7PM for delicious music, food and wine. Tickets are selling quickly! In honor of National Coming Out Day, EECBaltimore and Decoda collaborated on the We Are Family Songbook Project, a song-writing workshop designed to bring LGBTQ youth and LGBTQ elders together to share stories, their challenges and triumphs, their culture and context, their history and herstory. We visited the incredible exhibit that inspired our program that we're performing at the museum on November 23rd. We were also blown away by the gorgeous performance space, the Velez Blanco Patio. Mérida, Mexico Carnegie Hall & Banamex Formento Cultura Professional Training workshop 2013.
critics' pick in the NY Times! Our concert this Thursday at Trinity Wall Street is a critic's pick in this week's New York Times! Visit our concert's event page for more info. Hope to see you there! Decoda's new website is here! This site will be the home for all our upcoming events, choice audio and video clips, special projects, and much more. If you want the absolute latest on Decoda, follow this blog on Tumblr using the button below. Have a look around and let us know your thoughts. We'd love to hear from you!